So how about that pontiff Augustus? Or should I say Mr. Augustus? 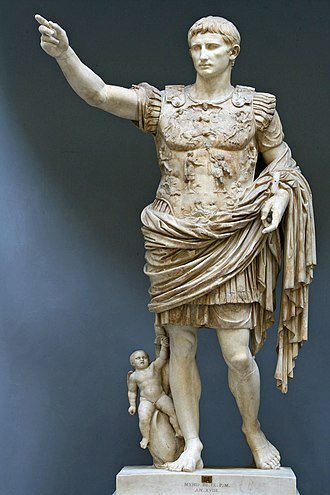 I ask because I’m referring to the Emperor Augustus, who insisted that he wasn’t Emperor, just this plain ordinary First Citizen who also happened to be supreme military leader for life, tribune and censor. You know. Like anybody else. Oh, and also pontifex maximus. Not Emperor, no really I’m not, from 27 B.C., he only added the title of Biggest Bridge-builder in 13 B.C. when his rival and previous title-holder Marcus Aemilius Lepidus died in exile. Pontifex maximus was, generally speaking, a religious title in Rome, basically the chief priest of their blurry Olympian religion. Although as separation of church and state was as unknown to them as really clear and logical separation of powers within the state, the office carried important public and political power due to its authority over “religious” law which included the calendar that influenced public life (the pontifex could insert an extra month in a year if a political ally held office, for instance), burials, marriage, adoption and wills and also the regulation of public morals. Plus custody of the state archives and keeping the official minutes of elected magistrates. In short, a very major office with a potential importance out of keeping even with the official description, to the point that it was tussled over by politically prominent families at least in the late Republic when it was held among others by one Julius Caesar. After the Emperors bagged it they kept it, rationally or not, until the 4th century when Christianity came to dominate the empire and the title, though not its older functions, slid over to the bishop of Rome. Interestingly, it has never been officially added to the Pope’s titles, though. Much as I admire Rome for its understanding of the rule of law, where they were well in advance of the Greeks, they never figured out how to tie down the state to popular will without veering into the demagogy that too often convulsed Greek politics. The fact that such an odd title of pontifex maximus could be added to that of Emperor by a guy who denied he was one, and then proceeded to govern so well that it seemed to legitimize the arrangement, underlines that there were critical elements missing from their system that would not appear until medieval England really did fuse rule of law with rule by the people where Athens and Jerusalem met in Rome then got into a Saxon longboat. It was not until the Renaissance supplanted the Middle Ages that a king in that realm would claim also to be the chief priest, the egregious Henry VIII. And luckily, it was a claim that was almost never taken seriously by his successors. I’m not sure it really was by Augustus either. But that’s because I don’t think the Romans took their own religion seriously by that point, plus the First Citizen was just sweeping up all the fragments of state power. Whereas in England it didn’t happen because they did take their religion seriously, and wouldn’t let anyone sweep up all the fragments of state power.